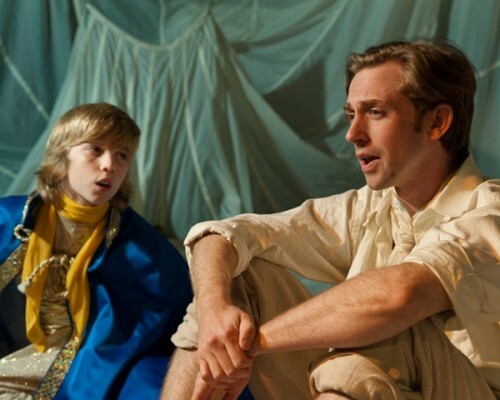 Ian Pedersen as the Little Prince and Alex Vernon as the Aviator in Ambassador Theater's "The Little Prince." There are many delights in Ambassador Theater’s production of The Little Prince, but chief among them for me was watching the reactions of the children in the audience. “Who I am writing a review for?” I asked myself afterward. It’s unlikely any of those enraptured five-year-olds would care what I think. Their parents? Perhaps. Funny then that this push-pull between the world of adults and children is at the heart of the much-loved book by Antoine Saint-Exupery (or Saint-Ex, as he’s affectionately known in my neighborhood). If you’ve never read the book, written by French aviator Antoine Saint-Exupery after surviving an almost-fatal plane crash in the Sahara, or haven’t read it to your child, don’t worry. This adaptation by Rick Cummins and John Scoullar is quite faithful but easy to navigate. Children rarely figeted and their attention was held throughout. This is in no small part due to director and designer Lilia Slavova, who ably guides the ensemble of four actors through a hypnotic world. It’s also a testament to young Ian Pedersen, who embues the Little Prince with a stoic yet hopeful melancholy that’s engaging to watch. Though he has to deliver many lines with a dreamy air directed outward to the audience, he manages to make the usually mystical prince a very real boy. His interactions with his beloved and vain Rose, the dangerous Snake (both wonderfully performed by Ilana D. Naidamast), and the spirited Fox (Sarah Olmstead Thomas) highlight the lessons children have to learn in order to grow. Note I don’t say grow up. That pitfall is embodied in the woeful Aviator (Alex Vernon), whose inability to see with a child’s eye anymore has almost broken his will. The Aviator’s struggle to regain his youthful hope may mainly resonate with the adults in the audience. It’s the one difficulty in this production, and however talented an actor Vernon is (his masked turn as a self-centered king is truly hilarious) those strident moments seem to deflate the magic. But that’s a flaw easily overlooked. My inner child’s favorite moment was the meeting of the Little Prince and the Fox. Having just heard that scene read at the wedding of a dear friend, I was reminded of how it struck me as a child – sad, wistful, full of the inevitability of love lost. However, Slavova wisely pumps up the gleefulness of this meeting with an adorably funny dance between the two, and Olstead Thomas’s Fox is so friskily frantic that taming brings a necessary and lovely maturity rather than a heartbreaking sadness. Parents with children easily frightened should note that the Little Prince’s scenes with the Snake are mysterious rather than obvious (his disappearance from earth is in blackout) and I didn’t notice anything other than normal apprehension followed by delight when the masked figures began to appear. Truly, this is a lovely evening at the theater for children and especially for parents looking to introduce them to an almost surreal, magical theatrical experience. And if you yourself, adult, are looking for an escape and a reminder of what is essential, then rest here for a while. Ambassador Theater’s The Little Prince runs through November 7 at Mead Theater Lab at Flashpoint at 916 G Street NW. Closest Metro: Gallery Place (Red/Green/Yellow lines). For more information call 703-475-4036. Thank you Jen,so much for coming and writing a wonderful article about the show! The very young performers need good words and i feel privileged to help their cariers.